UPDATE: Sometimes things DO work out. The man did not want to lose our business. In fact he seems to really want to protect us. So, he is doing the night duty himself until he can find someone reliable. This is a huge relief as he stays awake, walks around, and keeps an eye on what is going on. Has he dozed off sitting in the chair? Of course. It’s really normal. I don’t get upset about that. This morning he brought in a new day guard to meet me. The boss will continue at night for now. He asked if we can start over. New day begins. All security agencies provide deteriorating service over time. It’s one of my “Harrison’s Rules of Life.” It can take a year, or two weeks, which seems to be the latest case. Each starts the same, whether they came recommended by someone, or from the internet…. They “LOVE’ this home and the work I am doing. Usually they call me “Ma” but this one refers to me as Didi. The line goes something like, “You are my Ma/Didi and I will take care of you.” I think they learn this from watching satire. First ever security agency was fake. One of my board members, actually our Treasurer, arranged the service. Then the local goondas discovered he was fake, fake company…..
Then there were the ones who were getting drunk from alcohol from the goondas next door. Then there was the one I found, around 3 am, lying in our entrance way playing with myself. It was really hard to make the phone calls to tell the company what the problem was. Along the way I hired G4S. They are the same company that didn’t do so well for the Olympics in London. They are the best known, and guard the consulates here in Kolkata. It was nice to have them because they responded to the complaints, so it was a feel good, but the guards slept and drank. Early on the local goondas decided my guards were entitled to sleep. These were 12 hour shifts. The goondas demanded I provide blankets and pillows. I refused, said I’d rather save the money and guard by myself (behind the locked grille). When I finally demanded this guard be transferred he turned to the community and that was the cause of the first of our riots. By riots I mean about 30 drunken men, and the women neighbors too screaming at me to leave, telling the girls they will kill me, and telling me not to call the police because they owned the police. When I called the local political leader he said, “They don’t want to hurt you. They just want your money.” That was so reassuring. One time when I got rid of a company, we cleaned out the locker and found a bag of condoms and empty alcohol bottles. The cost has ranged from about Rs. 16,000 to Rs. 26,000 a month. That’s a huge part of our budget. This is really sickening, isn’t it! We had a guard about a year ago we really liked. All of us liked him. Then we found out he was giving his mobile phone to the girls and trying to set them up with local boys. Oh yes, and then there was the massi who was stealing money from me and passing it through the window to the guard…. and riding home with him on his bicycle. Where do I go from here? I guess I go the same place, the same route, because it is the only one here…. This is Kolkata. Nothing works. It’s not intended to work. I’m angry. I’m angry enough to tell him just to leave, to fire them now, to just live without a guard. We would be safe for the night, but the criminals would come over the fence and steal everything that was not chained down. Another guard story. Saraswati Puja is celebrated in late Jan or early February. 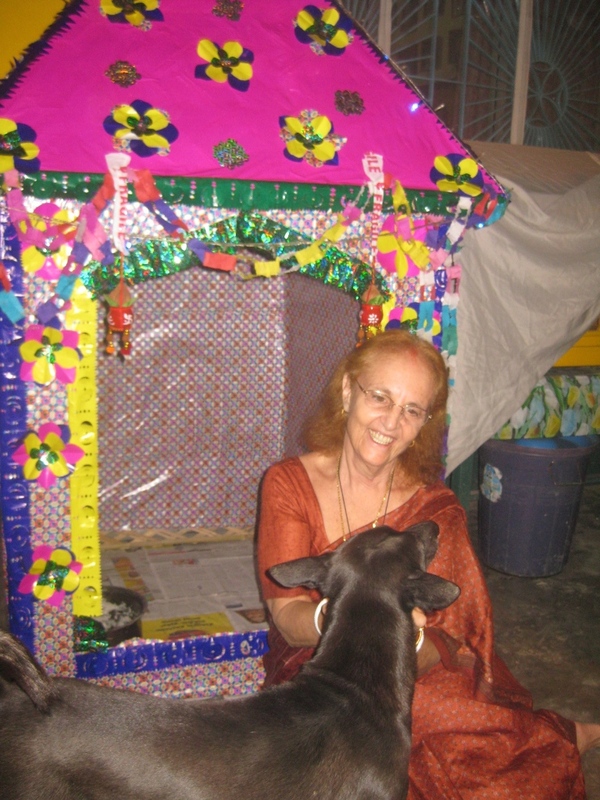 Two years ago we bought a woven cane pandal to put up, and to decorate. The statue of Saraswati was inside. (No, that wasn’t stolen.) After the holiday I wanted to put it in the garden as a play house for as long as it survived the weather. It was about 6’x6’x6′, perfect for the kids. A couple of days after the Puja, I suddenly noticed it wasn’t there, in the front and it wasn’t in the garden. It was GONE. What is amazing is that neither of our guards had any idea where it had gone! Six by six by six had just absconded. The next day I heard from someone, I can’t remember who, that a neighbor had it. So I went to the neighbor with one of our teachers to translate. We were a funny sight. Only the woman was home in their tiny rented quarters. “Yes, my husband brought it here.” I didn’t see it though and she pointed to the ceiling as the panels had been taken apart and put up for insulation. I smiled and thanked her and said no, there was no problem. I just didn’t know where it was. So then the guards who had no idea where it had gone said they thought I was throwing it out so they gave it away, and so on. This is boring, to write, and to read, but it’s the stuff of what drains my time and my energy. I feel incredibly alone with this. I’ve just gotten off the phone with the eldest sister of our oldest girl. My office door has been closed, Seema Gupta, our girl, and I on the phone. I walk out to talk with the staff while our girl goes to talk to the other girls. This is not really a surprise to them, but it is to the staff. 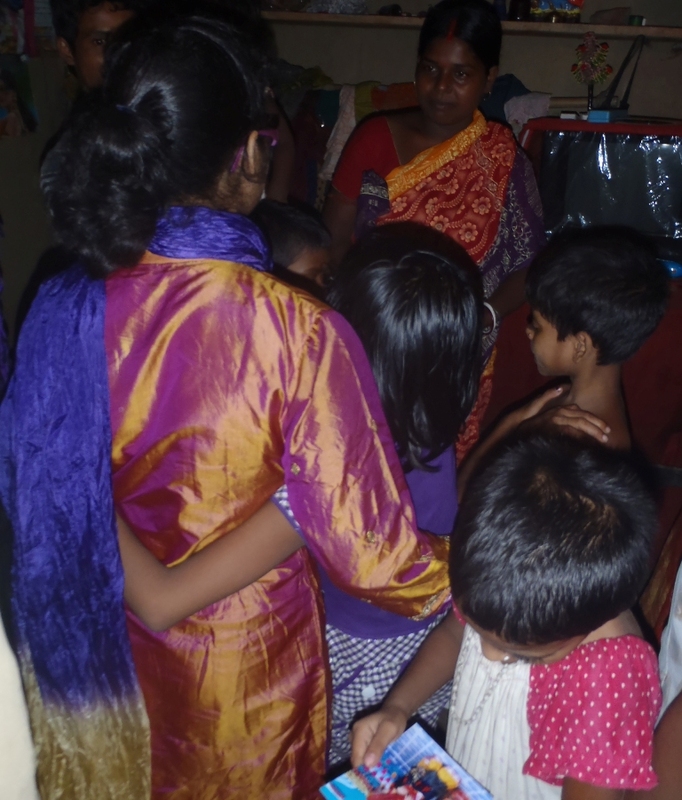 “She is going to live with her Didi (elder sister),” I explain to some of the staff. They know her mother had died when she was born and that painful traumatic events had taken her to the government institution and then to us. In the past year we have learned her name, her real age, and we have visited her relatives in the village. “Her sister will put her in the local Girl’s High School, and after school she will help with their sewing work that brings income.” Her sister had been looking into this since our visit as she couldn’t get her youngest sibling out of her mind. It was as if she was waiting for our call. I think their first choice would have been for her to stay here where she has a “better” life — the rational view. But it seems that now, after many years, emotionally they want her to come home, and they needed for her to want to come home. “No,” I explain. “She doesn’t care about that. It means nothing compared to being with her family.” It’s what I’ve been saying about all of them. They don’t care about “stuff” or even food. They would give it all up in a second to be with family. Staff ask me, even suggest, that I must be upset — after all I’ve done. They don’t get it though. My mission is to care for orphans, and to figure out what they need. I started this home with the question “what do they need?” Then we build on ways to meet those defined needs. My job is to lead them to where they need to be. Like her Didi, our girl has been unsettled since the visit, her mind constantly going back to her family. Last week we called her Didi and it happened to be when the sister’s daughter was in labor with her second child. So our girls got on the phone with her, talked and distracted her from the pains. In the morning we learned that a boy had been born. In the Indian system of naming relationships, our girl is now a grandmother. She wants to be there to take care of the baby. To be an orphan in this culture is to live in shame. I don’t expect it all to go smoothly. I’ve dealt with village expectations. But I know our girl is strong. I believe she may be a leader. I know that she cares about the poor, writeS about the poor, and wants to help the poor when she grows up. I suggested she keep a journal. She gave the “the look.” Oh well, I tried. Maybe one day she will want to. I have walked this path before. The other girls, how are they? It’s mixed. Some are upset. They think about their families, want to find them if they can. One girl was remembering her house by the water and a factory along the water, and we knew the town from which the police report came so we went on Google Earth looking for a factory and water. One day we will go there and start with the police station, the police report. Does she want to go back? I don’t think so. But she wants to know if her grandmother is alive. They are losing their Didi, who I often thought of as Wendy and the lost boys of Peter Pan. Wendy has a home to go back to. There is yet another pull among the girls. They are survivors of family betrayal. They protect themselves and at some level trust no one. So they worry, and ask me, “Who will take care of us if you die?” They panic if I have a headache. They know I had cancer. So, each girl here is also trying to figure out her Plan B, “What if Mummy dies and no one will take care of us?” So I go through the list of people who care about them, the plans we have in place, but they still worry. I worry too It’s what mothers do. 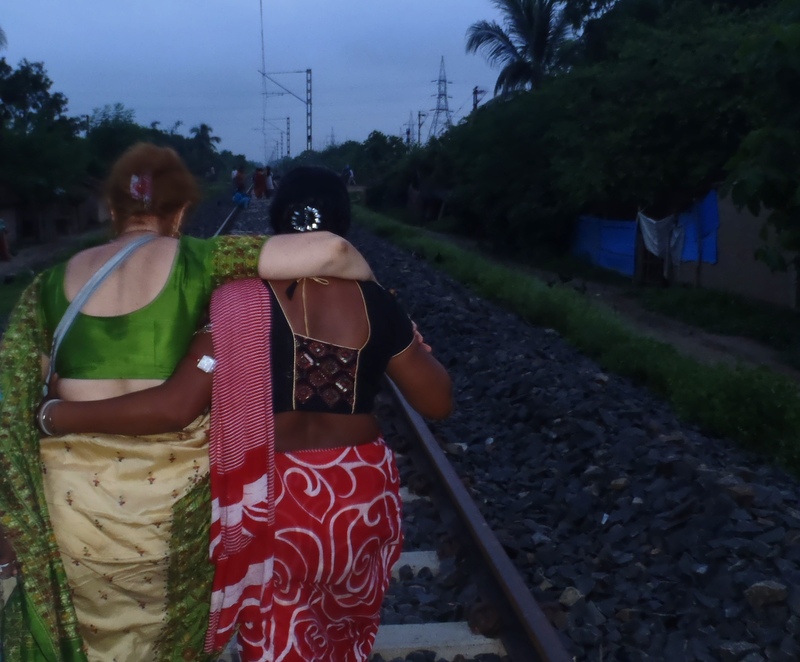 I’m walking along the railway tracks with her Didi at the end of our visit. The same subjects keep coming up! The girls are totally confused about the concepts of square centimeters and centimeters squared, and still mildly confused about length and area. 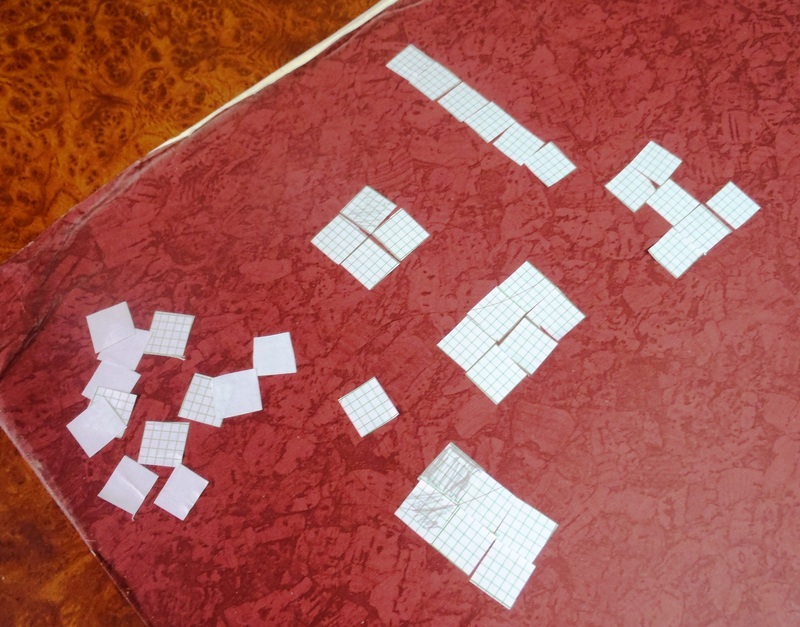 We cut 1 cm squares and made shapes. This came up because I asked them to do a drawing 2 square centimeters. Failing that we went back to 1 square centimeter. You see, when I asked for 2 square cm, I got a square 2×2, which was really 4 sq. cm. They were working on a principal or pattern of a square of 2 cm sides so you square the 2, namely 2 squared, but that’s 4 square cm, and not two. We made progress, I hope. I like the creative design which was right as another way to get six square centimeters. We also talked about tiles on the floor, how wide the table was, and then if we wanted to put all the books in a box we had to give it height, add another dimension. We talked (I talk and hopefully they nod and when I asked what they thought they answered in centimeters). I don’t know what stops them. They are smart kids and I said I wouldn’t be spending these hours with them if I didn’t think they were able to get it. They freeze, the deer in the headlights I wrote about last week. Today the image was of children crouched in a burning house, afraid to come through the open door. They are so afraid of getting it wrong they can’t think straight. It’s not about language because they had the same problems when they were learning in Bengali. But then last year when they were still learning in Bengali their math teacher was confused about length and area. important because she doesn't want to incorrectly advise her students. The answers are confusing and there seem to have been some changes in the 50 years since I studied math. There is some difference between the symbols used for squaring and the words. HMMMMM as Ganga would say. I'm really glad I decided to write about how confused the girls are, since I'm now confused. But, the concept, the squares, the area, how you build area and then cubic space -- those are the fundamentals we need to keep working, and meanwhile I'll have to find some help on the symbols. As I pointed out to the girls, if we are going to get tiles for the dining room floor it really matters whether we have  64 sq feet in our 8x8 room or 64x64 sq feet, which is 4096  sq. ft, and a bit out of our budget. GK is a school course in Indian schools. I first was introduced to it when I was staying with Gibi’s family and helping Jugal with homework. I’d been puzzled by the questions he seemed to be studying, one day movie stars, and the next day flags of different countries… seemingly random questions and subject matter. Well, that’s what it is, random, and what you would study if you were preparing for a general quiz. Quizzes are very popular here. This year is the first year the girls are studying in English, so I am more able to see what they have to learn. I’m working with all their subjects to help them find ways to learn, remember more, get higher grades (that’s being blunt). They are capable of doing better than they are, at least the ones we have in an outside school. Thursday is a GK test, so I suggested we begin a few days early preparing. They showed me three pages in their GK book. One is about animals, facts about several different animals and where they live. This included polar bear, jackal, pangolin, hyena, armadillo, gibbon, bactrian camel, and opossum. This evening we went online to look at images and a few videos of them. Then there is a page of water animals and fish, and last is the page I’ve copied below. Well, part of the page is here. There was even more. The task: to learn what these abbreviations mean. 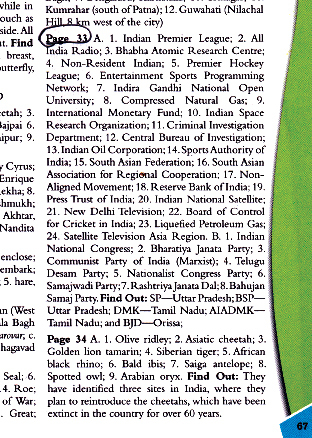 They don’t have to know anything about the subjects or the organizations, just the names and abbreviations. I asked, “How will we find the answers?” I was concerned about how they would find all these names, how I would help them, but there was no reason to worry. They opened the book to the last pages and showed me all the answers to page 33. It’s how they had found all the names of the animals, from the back of the book. “Aha!” I said, and then asked them to leave a copy of the book with me so I could scan it. To be learned for a test this week. Next, the answers from the back of the book. They are random. I also had to explain the differences (?) between organizations, corporations, associations, companies, bureaus…. 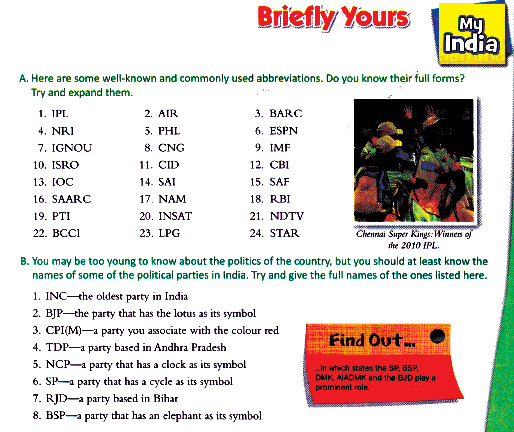 So these are the answers below and they have to make lists of the abbreviations and the names. It’s now the 4th of July, night time, and today there was a crisis at the school. A teacher said to our girls, “You eat grass from a field?” Then, “Where do you find your teachers, on the road?” The girls have been demeaned a lot, and picked out as a special group for demeaning. Actually there is a lot of demeaning going on in the school. It seems to be the default attitude among some teachers. So I went to meet with the admin, and took Gibi along. I decided we would approach the school as “sad” and that was fairly effective. We got apologies, as the school admin does not want this kind of behavior. But it’s the culture of schools. This school has taken it seriously. They asked why I didn’t come earlier and I said simply I was afraid, and the girls were afraid that there would be retaliation. But today the girls broke down in class crying, and Ganga’s teacher saw them and called me. Well, now at 11 pm they are still studying the abbreviations. 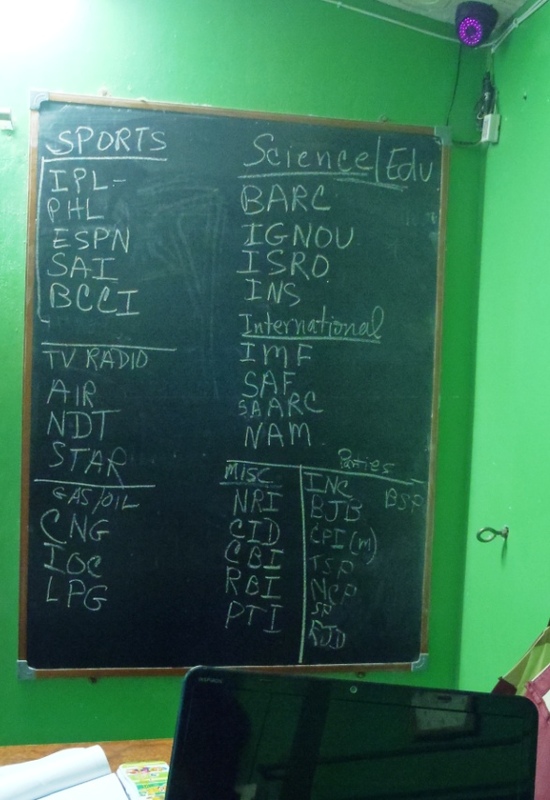 I decided to help by organizing them by function… sports, tv/radio, science & education, etc. So this is my contribution. I seem to have gotten a few wrong, but the girls corrected me. The girls had about three hours of Bangali and math homework before they could get to this. It just hurts. One teacher refused to call them by name, referring to each one as Shishur Sevay. I tried to explain to the school that these attitudes are not conducive to studying or self confidence. I’m not sure it registered. I do believe though that the Founder, Principal, and Vice Principal with whom we met have taken us seriously and will try. A few weeks ago we were working on a grant application and they asked us for what we thought were our three biggest accomplishments. Well, our biggest and best is that WE ARE HERE! We have survived five years. We continue to thrive and we keep taking one obstacle at a time, one day at a time, one test at a time… I know I keep repeating myself but I can’t stop thinking, “You eat grass?” This is about animals, cows, horses, sheep, goats, not children who have been abandoned and abused…. The words stay with me as I know they will stay with the girls, stacked on top of all the other demeaning and humiliating remarks that have been made to and about them. And tomorrow when they take this GK test, they will have to push all this from their minds and try to remember that RBI stands for Reserve Bank of India, and not Runs Batted In, which is what Maggie and I thought at first.